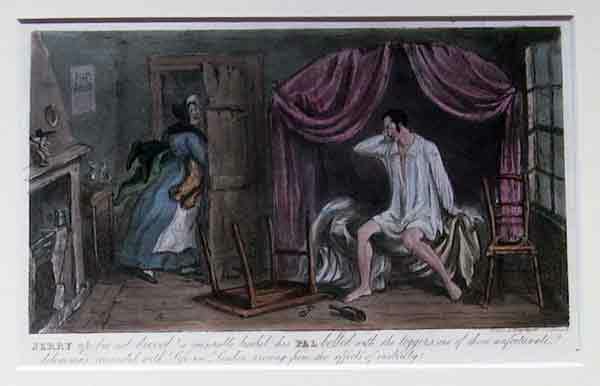 Illustrated by George and Robert Cruikshank, it was a tale of generally rakish behaviour that also became an instant success in the theatres of London, running at the Adelphi for two seasons, and being exported to France and the US. The term ‘Tom and Jerry’ became a euphemism for riotous behaviour and was, from 1830, attached to the avalanche of small beer houses – Tom and Jerry Shops – often set up in people’s houses, that appeared in Britain after the Beer Act of 1830 freed up the market for ale. These were to continue throughout the 19th century. The term also became attached in the US to a hot eggnog style drink, spiced with brandy and rum, probably some time in the 1830s and purportedly invented by one Jerry Thomas. The drink swept the US for well over a century, most particularly as a Christmas drink, and with ‘Tom and Jerry’ punchbowl and mug sets to drink it in. The violent and riotous behaviour of a cat and mouse, and the 19th century punchbowls that now turn up in American antique shops, are examples of those curious echoes of history which constantly crop up, but of which we are mostly unaware. This entry was posted in Echoes and tagged rake, riotous behaviour. Bookmark the permalink. This post certainly illustrates some very important areas. This kind of detail should certainly educate your other readers too. this makes Excise taxation much more clear. That information has solved my query regards the original name (Tom and Jerry) of the White Hart public house , also known locally in my early years (1950’s as The Jerry Rails. Quite a search but very satisfying ! Cheers!